For something to catch on it has to come along at the right time, and has to have the right messenger. 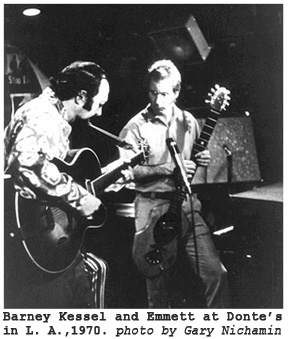 Two-handed string-tapping was not invented by Emmett any more than flight was invented by the Wright Brothers. Inspired by birds and insects all around them human beings had pursued flight for centuries, spurred on by mythology and by a yearning to be unbound by the earth. Invention is different from discovery. Inventors engineer new ways to do specific things. Explorers aren't always sure what they are looking for. Emmett didn't seek to play a guitar by tapping on it with both of his hands. What he sought was a greater orchestral capability and more freedom in his music. Inspired by the harmonic complexity of pianists like McCoy Tyner, the "sheets of sound" of John Coltrane's tenor sax, and the fluid grace and power of Jimi Hendrix's heavily distorted guitar, Emmett expanded his homebuilt "freedom" guitar in all directions, more strings, greater range, and expressive devices. It was the late 1960s, and music was exploding! In the 1940s Harry DeArmond, a prolific pickup and amplifier designer, came up with a way to demonstrate the sensitivity of his pickups by merely tapping on the strings with both hands. He developed this into a way to play song arrangements, and taught the approach to guitarist Jimmie Webster, who worked for Gretch Guitars. Webster wrote a short book on the subject, called the method The Touch System, and traveled around demonstrating the technique. But it never caught on. It's impossible to say why it didn't, but one reason could be that the right hand's role was limited by holding it in the conventional orientation guitarists still use today, with the fingers of the right hand lined up perpendicular to the frets and to the left hand. This meant that players needed to move the whole right arm at the shoulder to play melodic lines, which was much more awkward than what their left hand could do with the fingers alone. What two-handed tapping needed in order to take flight was a different approach, one that would give the player more control and capabilities than The Touch System would allow. Timing being everything, Emmett would also be able to take full advantage of the revolution in amplification and signal processing that was just beginning. All of this appealed to two aspects of Emmett's personality, the inventor and the explorer. In his music as in his instrument and electronic designs, both of these characteristics hold sway. As a result, The Stick would become a part of the unfolding story of electric music, coming along at exactly the right time, and brought forth by a musician who was not wedded to the status quo, but who wanted to explore the harmonic and sonic universe he knew was out there, and could build a rocket ship to take us along. There are some great articles on the subject of exactly how Emmett discovered his method. His own thorough account, "The Evolution of a Musical Art", was published by Electronic Musician Magazine in 1987, and Jim Reilly's, "The Birth of Two-Handed Tapping", published by Bass Guitar Magazine in 2003 add's some recent developments. So this article will focus more on Emmett's music, his interest as a composer, an interpreter of standards, and an improvisor, and how his new method and instrument became the perfect vehicle for it. It will also discuss his role as the first teacher of the "free hands" method. 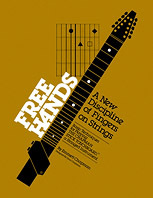 He taught it directly to hundreds of musicians (mostly guitarists) through private lessons and at music store clinics and Universities around North America and Europe, and indirectly, through his method book Free Hands, A New Discipline of Fingers on Strings, to thousands of musicians all over the world. For a look at Emmett as an inventor and designer see the innovation section.